I will sing louder. When I lend my voice, lifting praise of God and Christ, I will sing louder than ever before. Never mind if I sound off-key. The angels will laugh. Holding the red, battered book of treasured hymnals up near my heart, standing in the pews where Christians pray, I will hurl those gospel tunes to the high heavens. Singing for the 27-year-old Sudanese woman sentenced to death for converting from Islam to Christianity. I was raised Muslim in America and converted to Christianity without retribution – because I live in America. Christianity has soothed my psyche, in many manners saved my soul. I will sing this song loud as I can. I will sing for Meriam Ibrahim and the 20-month-old child who is currently in jail with her as she serves time awaiting execution for her conversion. I will sing for the eight-month-old fetus she is carrying, a baby that will be allowed birth before mother is hanged. This baby may grow up denouncing religion altogether, an unborn soul, a witness to Muslim mayhem and religious rot. I will sing for the baby’s salvation. Catching up on the news today, I read articles about Meriam, a beautiful woman who also is scheduled to be lashed 100 times for “illegitimate sexual relations” because her husband is non-Muslim. Will she become the female Jesus on the cross – lashed and hung to die? 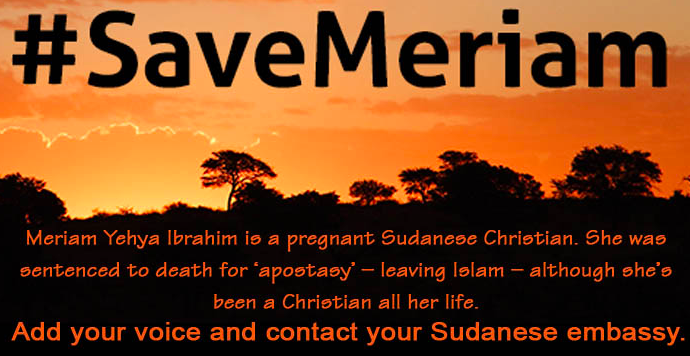 Sudan authorities are killing individuals who denounce Islam. Sudan’s penal code criminalizes the conversion of Muslims into other religions, which is punishable by death, according to an article by the Associated Press. That’s Muslim madness run amok. It’s one thing for parents to bully/guilt-trip their children into embracing family beliefs and carrying on certain family traditions. We see it often. And we understand that in every country some religious beliefs become law. But when a country will kill its citizens over a disagreement of religious ideas, that’s just crazy. That is about power and imposition. It’s about controlling what is precious: the human spirit. This is about forcing human beings – their mental and physical energy – to serve a particular doctrine. This. Is. Just. Wrong. Of course Muslim madness is not contained in Sudan. We read about Muslims bombing Christian churches in Cairo and elsewhere. We read about Nigerian warlords, claiming to be Muslim, kidnapping 300 schoolgirls, believing that Western education is anti-Islamic, threatening to sell the girls into marriage. These mad Muslims over-shadow the millions of sensible Muslims living quiet, productive lives, clinging to Islam because of the personal peace they have found in Islamic practices. Meriam, like me, found her peace/power in Christian customs. But she is called to pay a deadly price. Amnesty International weighed in saying, “The fact that a woman could be sentenced to death for her religious choice and to flogging for being married to a man of an allegedly different religion is abhorrent and should never be even considered.” In a joint statement, the embassies of Britain, the United States, Canada and the Netherlands expressed “deep concern” over her case. “We call upon the government of Sudan to respect the right to freedom of religion, including one’s right to change one’s faith or beliefs,” they said. Some will condemn this execution, which, even according to the Shariah law cannot take place until two years after the woman gives birth. Some will call for respect for religious freedom. For my part, I will sing the Christian songs my Muslim-bred heart has embraced. I will sing them loud and clear. I’m back. After a hiatus to settle in to a new job and complete my first ghost-writing assignment, here I am. 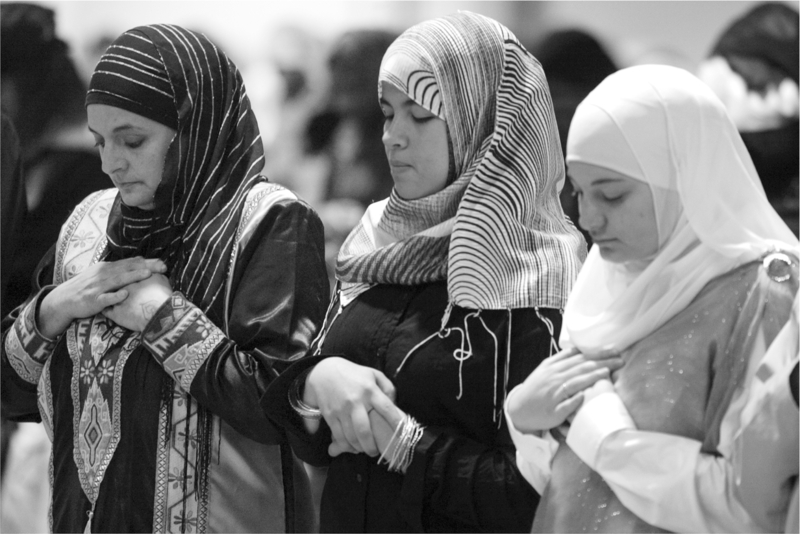 To ease back into blogging I will begin with my most familiar subject matter – growing up Muslim in America. Of course, much has changed since I began learning the doctrines of The Nation of Islam in the 1960s, then found myself immersed in learning Orthodox Islam in the 70s. These days, when I’m invited to speak to students and teachers about this subject, they inevitably want to know, “what do you believe now?” Last week a teacher asked me, “why didn’t you turn away from religion altogether after experiencing so much heart ache from it?” I told the teacher that for a few years as a young woman I had sworn off all organized religion and considered myself, instead a mystic, tuning into nature and divine inspiration more than religious traditions and customs. I returned to religion during a particularly challenging episode in my life because religion, and its uplifting philosophies were what I found comforting when all else failed. A high school student last month asked what religion I practice currently and I explained that I find myself loving my old Islam on my new Christian journey. The students seemed interested – quiet and attentive, hanging on every word. So, I kept going. Ok, “imperialism” was too big a concept for high school students who really were not interested in world affairs, and even less rhetoric left over from the 1970s. Imperialism? Does anyone use that word anymore? Besides, who has time for world affairs when Candy Crush and all kinds of other fun games are in hand? They were interested, however, in how I adjusted to life outside the Nation of Islam, since in the book I described growing up in a very closed and close-knit religious organization. They wanted to know what, if anything, I missed about the NOI. And, speaking of women, I love-love-love tuning in to Christian women preachers these days. OMG! As a Muslim girl I was taught that women should be “modest,” although the interpretation of “modest,” has evolved – thank God at least in westernized Muslim communities. As a Muslim girl I learned that a mother could not lead her own sons in prayer. A Muslim woman could never lead males in prayer. In fact, I vowed never to return to the Islamic Center in my native hometown, Washington, D.C., because when I was dragged there as a child for Muslim holidays, women and girls were relegated to a room in the basement. At best, when the Mosque was not crowded, we were allowed only to sit in the rear of the main prayer hall – behind the men. So, you can imagine my delight the first time I tuned into a Joyce Meyer sermon on-line. To see a woman passionately yelling and screaming scripture and her interpretation felt like heaven on earth. Ok, this entry is getting too long for a blog. So, I will end it hear with plans to return to this space once or twice a week getting back in the blogging groove. Send me a note. Let me know what you think. And if you’ve got questions about my Muslim-Christian experience, I promise to take time and answer them. The book is just too big for me to take it all in at once. It was a novel dare. I would read Manning Marable’s controversial “Malcolm X: A Life of Reinvention” in a week and either join the parade of reviewers and social commentators praising his thorough research, or chime in with Bro. Malcolm’s children and grandson, condemning the tome for its dusty innuendo, questioning the author’s motives. I planned to swallow the book whole. But it was too big. Besides, halfway into it I realized I had “been there and done that.” Next! Half way into the book I was fully appreciating its exhaustive research, its discovery and disclosure of details and FBI documents I had been unaware of as a child growing up in the Nation of Islam, which Bro. Malcolm made famous, and in turn became famous for. The book was coming up short on what I had hoped to get – a sense of the overall experience of the organization and the people in Bro. Malcom had miistered to. I had hoped it would reveal a better sense of the men, women, and children Bro. Malcolm was motivating to build what, as it turned out, would be a front-runner for the mega churches of today. The 595-page book requires a substantial commitment of my time, mental energy, and interest. I simply did not have it to give – yet. I bought the book, full-price. Cash, thank you very much, but it would cost more than a couple of weeks of good time to read it. I love reading, but it is a slow grind for me. I have to savor a passage word-by-word, digest a chapter at a time. I’ll pick up the Malcolm-Marable “master piece” again. But right now, I am more interested in hearing from other former NOI members about their experiences in the organization in the 50s, 60s, 70, 80, 90s and now. So far, based on just a few interviews I’ve done, no one wholly regrets their time in the Nation of Islam. The former members I have talked to, in fact, are grateful for the lessons they learned and for the motivation, self-discipline and empowerment they gained – even if they won’t send a dime to keep the organization going because of the manners of corruptions and personal distress the organization has also caused individuals and families. However, in case you missed it, here is one former NOI brother outraged by the book – to the tune of a $50 million lawsuit filed last week: http://www.wbgo.org/newsarticle/former-nation-of-islam-minister-is-suing-writer-and-publisher-of-new-malcolm-x-biography. Also, reading what Bro. Malcolm’s grandson had to say last week on what would have been the icon’s 86th birthday was well worth the time, and I am sooooo looking forward to the book he is writing. Check him out here if you missed this: http://newamericamedia.org/2011/05/malcolm-x-grandson-decries-marable-biography-on-86th-birthday-observation.php. If you, or someone you know spent any time as a member of the NOI, please hit me on facebook. I would loke to speak with them. Marable’s book, particularly the interviews with some of the former members, will add historical context and overview to what was my personal experience in the NOI. I will pen a review of the book as soon as I have read and digested it completely. My experience in the NOI is shared in my memoir, LITTLE X: GROWING UP IN THE NATION OF ISLAM, and some of the bitter fall-out from the experience is detailed in my book, DO ME TWICE: MY LIFE AFTER ISLAM. But my years of reflection to finally make peace with that experience is something I will share as I reflect on Marable’s book.